The Forto clan is at the Fur Rondy in downtown Anchorage. We watched the start of the sprint sled dog races. 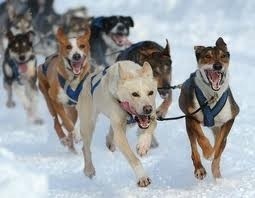 It still amazes me that these guys run up to 20 dogs on little tiny sleds with not much of a brake. They wouldn’t be able to use the brake anyway. Contrary to popular belief there is not tons of snow packed on the streets, even with the 100 or so inches this winter of the white stuff, they still truck in loads of snow on 4th. Other events are a weight pull, a carnival, a snowboarding demo, outhouse races, running with the reindeer (next weekend), and poker tourneys at The Peanut Farm. What is the Rondy you ask? This is what Anchorage was founded on. In the early days the fur traders would converge on this port city to trade their furs with the folks that would take them to far off lands. Of course the sled dog races have been an integral part of this too–since the 40s–with some of the greatest dog drivers in the sport’s history. Names like Doc Lombard, Huntington, Attla, and Joee Redingtion, among others. These days some of the best mushers in the world compete in the races: The Kormullers, Ellis, Chezik, and Greg Sellentin, the publisher of Mushing Magazine running the Rondy as a rookie in the field of 24. We grabbed lunch at Phyllis’s Salmon Bake and sat next to none other than “Lord Trapper” in his fancy $3500 fur parka and sportin’ a sash and a staff. Very cool.